Our minimum order is any 3 bottles. "S" SINGER CUVÉE 2016 RED TABLE WINE, NAPA VALLEY. In France, the wine term "Cuvee" refers to a stylistic blend. 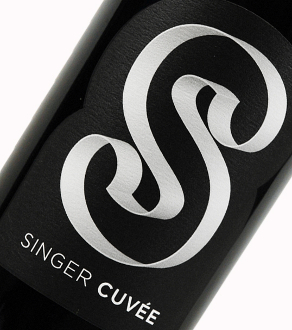 Modeled after the sophisticated red wines made in the famous winegrowing region of Bordeaux in France, the new release of "S" Singer Cuvee by Singer Cellars is made with premium grapes from Napa Valley. The end Result is a fabulous combination of 52% Cabernet Sauvignon, 24% Merlot, 14% Cabernet Franc and 10% Petit Verdot. In the glass, the wine opens up with lively aromas of dark fruits, ripes berries, allspice and fresh baked toffee. On the palate, the concentrated flavors of ripe plum, black cherry, cassis and black raspberry are enhanced with nuances of chocolate, savory spices, roasted nuts, and a kiss of fine French oak. From the beginning to the end of each sip, it's a wine that is deep, rich and focused. SUGGESTED FOOD PAIRINGS: Medium chesses, wild mushroom risotto, oven-roasted chicken with fresh rosemary, grilled pork ribs, juicy burgers, and slow-cooked winter stews.